Google Nexus 4: Nexus 4 is Google's latest smartphone, developed together with LG. It has a quad-core processor which means it's super fast, a crisp 4.7" (320 ppi) display that's perfect for looking at photos and watching YouTube, and with wireless charging you just set the phone down on a charging surface to power it up, no wires needed. 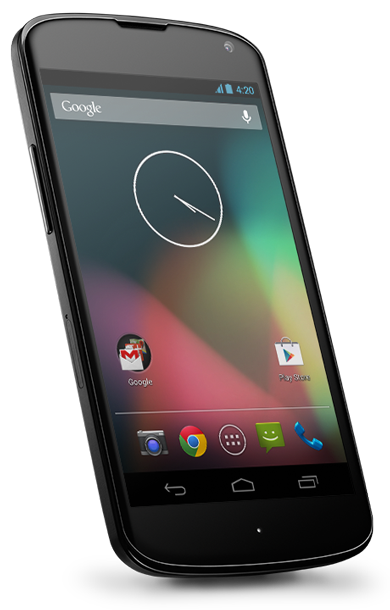 Google Nexus 4 smartphone: Developed with LG, it features a quad-core processor, a 4.2-inch display, 8 MP Photo Sphere camera and a wireless charging feature that lets you power the phone by setting it down on a charging service. It runs Android 4.2 (Jelly Bean) and a feature called Photo Sphere for creating 360-degree panoramas. The phone goes on sale Nov. 13 for $299. Google Nexus 7: Nexus 7 now comes in new Wi-Fi models that are 16GB (for $199) and 32GB (for $249). Google also is making a version available with an HSPA+ cellular connection -- $32GB for $299. It's on sale Nov. 13. Google Nexus 10: developed with Samsung, offers what Google calls the highest-resolution screen in the tablet marketplace at 300 pixels per square inch. That 2560 by 1600 pixel display will still get nine hours of video playback, Google says. And it has an account-switching feature that lets multiple users share the tablet more easily. The 16GB model goes for for $399; the 32GB model costs for $499. It's available from Nov. 14. Google Play: More entertainment, more countries. 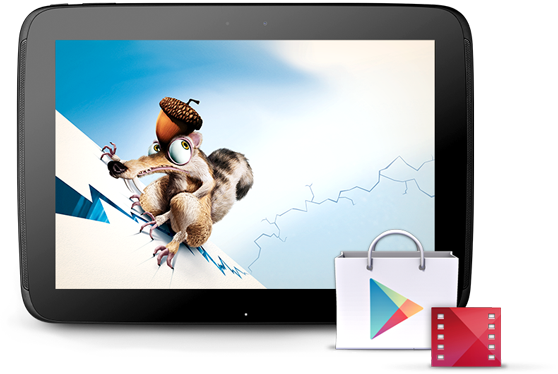 A ton of great new entertainment items are added to Google Play, such as movies and TV shows from Twentieth Century Fox. Earlier this year the service was expanded service beyond movie rentals and now you can purchase movies and build a library of your favorites in Google Play. Movie purchasing is available in more countries - Canada, the U.K., France, Spain and Australia. Google Now: Its predictive-search feature that presents information on a series of cards without the user having to search. In addition to weather and traffic information, cards will now display flight information, restaurant reservations, hotel confirmations and shipping details.